-GloboTech "Sand Storm" Hover M.L.R.S. PS: Thier Sizes are also good to use in Ra2/Yr. Note:Credit Me please when using them in you mods. 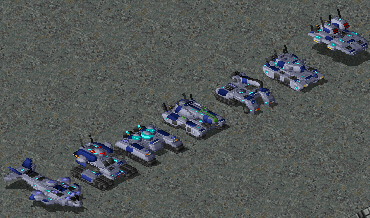 I've allowed myself to add "Unofficial Fan" to the topic title, to make clear that these voxel aren't from TI. However great work on these voxel. You get my Spotlight vote. very nice..........do you ever sleep? Sleep ? i made 2 each day and the aircraft was ready some time ago ,yeah i got a lot of sleep . Sticking in a spotlight vote for these. Wish they were in RA2 size as I would use a few of them. They Are i just Resized them to fit TI Voxel size you can Resize them using voxel pound and ReColoer them. Oh, sorry, I'm just retarded. I should have more carefully read the first post. Awesome sauce. The MRV. Shockwave's Tank Destroyer much? I might have some use for some of them, maybe even the TI boys aswell. They were released to public for a reason. Awesome voxels man. You got my vote for spotlight. awesome.. now, where the spotlight button?